Published in Rafu Shimpo, September 2, 1967. 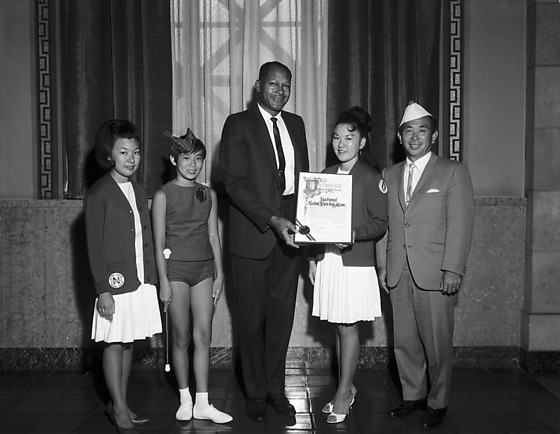 Los Angeles City Councilman Tom Bradley presents a City Council resolution to the National Baton Twirling Association to Lani's Flamettes and Lil Flickers Majorette Corps who represent sponsoring organizations 100th Battalion, Veterans of Southern California, Crenshaw Hawaii Chapter in Los Angeles, California, August 21, 1967. 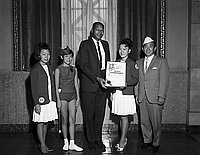 Tall African American man in dark suit and thin mustache and Japanese American woman in sweater over a white dress hold a large certificate between them. Man in suit and overseas cap stands at far right while thin girl in shorts, sleeveless shirt and cap holding a baton and another young woman with bouffant in sweater over white dress stand at left. Curtained window in background. They are identified (left to right): Nancy Kawabe (instructor), Gina Sato (Captain), Bradley, Linda Lani Kaya (Corps Director), and Lloyd Seki (Drill master). Typed on original envelope: Kawabe, Mrs. -- Resolution to Flamette at City Hall.